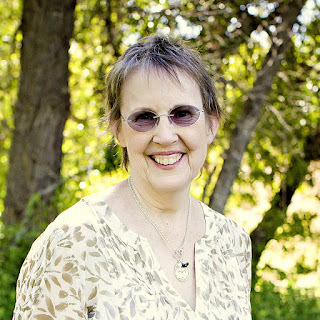 This is my next door neighbor, Reta. She's a wonderful neighbor and a great friend. Could you guess that she'll be 89, next month! This year she put up a small tree next to her front door. I snapped this photo, when we went over to play cards at her house last week. Reta made all the ornaments on her tree and the tree skirt. They're all fantastic. I would have never guessed she was 89. She looks wonderful! She's amazing! I love homemade tree ornaments - they're the best. Sweet ladies have no age. They are just amiable. Wow.. 89! That's an achievement. Her tree looks so pretty. 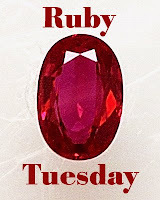 My Ruby Tuesday posts are here and here. Hope you can pass by, too! She doesn't look 88 or 89 to me. What's her secret? What a lovely little tree full of ornaments! Handmade too - awesome. wow your friend got a lively Christmas tree and i never guess she's 89. i thought she is still 20 years younger than that number. Say hello to Reta for you. First of all, she doesn't look 89! 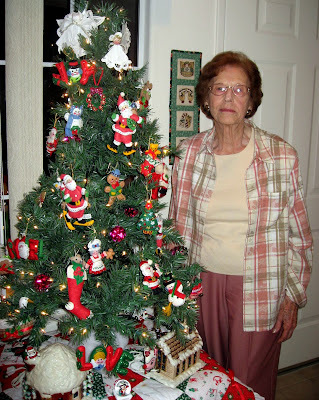 What a sweet lady, and those ornaments on the tree are darling. I so envy anyone who can make things like this. Wow, what an amazing lady!! I NEVER would have guessed that!! And she's got style, her tree looks great! She looks WONDERFUL! That tree is precious. I love the handmade ornaments.